Last night we were under a tornado watch, then warning, then watch again, then “only” severe thunderstorms warning. Let’s get one thing straight: I loathe thunderstorms. So to all of you psycho, lets-go-sit-out-on-the-porch-beneath-a-tin-roof-and-watch-the-lightning-set-the-field-on-fire folks: No, I don’t think it’s inspiring or refreshing or exhilarating. I think it’s terrifying. So don’t come crying to me when I’m safely nestled in the farthest corner of my closet, covered in couch cushions and surrounded by water bottles and you’re getting electrocuted or swept away or whatever else happens to you ridiculous people. Common sense. Go ahead and get some — then MAYBE I’ll let you into my impenetrable tornado fortress… maybe. I know and love many of those psychos, I’m just not one of them. I’m psycho in other ways — like spending 3 hours re-arranging one page of my scrapbook and considering it an accomplishment when I’ve decided on my “layout.” I know. RISKY. And I don’t even wear a helmet. This is John’s response to all of the hullabaloo last night: “Hey. Make sure you’re charging your phone in case we lose power OK?” He says as he sits calmly at his desk in the living room and I’m sitting on the toilet seat ready to jump into the bathtub. 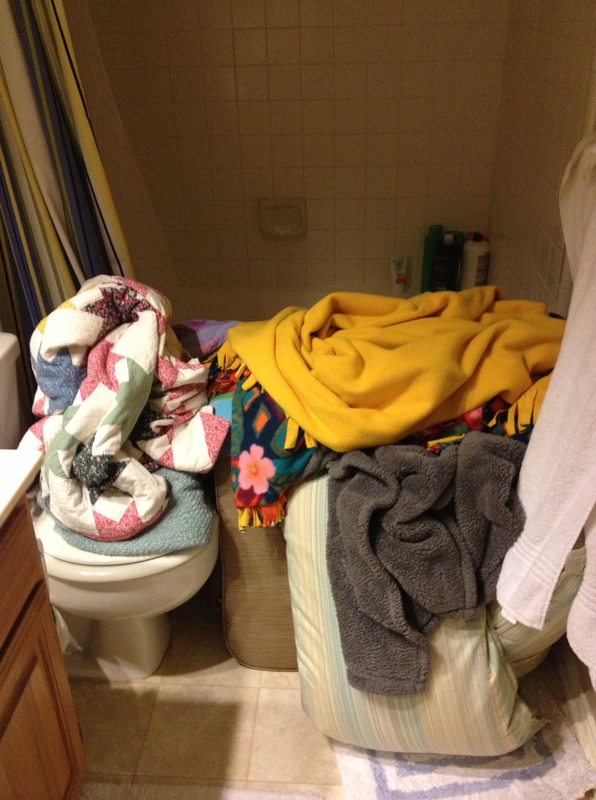 Then he took one look at my bathtub fortress and the damage was done. The rest of the night was filled with relentless terrorizing. But in that moment I realized just how thankful I was to be married to a man who was steady, equipped with a cruel great sense of humor, and calmly resting on the God who carries us through every minute of every day. For some reason I find it less difficult to trust God with our future, our goals, our dreams, and other big unknowns and more difficult to trust Him in the moment. John was so calm during the tornado warning because he strives to be faithful to God day-in, day-out, moment-by-moment. The faithful become the faith-filled. And I want that kind of faith. The faith that proclaims, “A Mighty Fortress is our God!” and hammers into life with gusto come tornadoes, or unemployment, or loss, or any manner of trial or disaster. So while it may wound my pride to say it: I think he chose the better fortress last night. And I’m glad he left the door open so I could come inside.